If you were to laugh at the thought of relaxing at the dentist’s office, you have never stepped foot into the practice of Gold Hill Dentistry. Did you know that over 40 million Americans avoid visiting the dentist because they are afraid? Most of these people are adults who lead normal lives, hold stable jobs, and participate eagerly in life. However, they are so anxious about sitting down in the dentist’s chair that they will put off regular cleanings or even needed oral health treatment. Gold Hill Dentistry is proud to be a dental practice that helps to alleviate these fears so that people receive the dental health care they need. From the moment patients step through our doors they will find that they are in a comfortable environment. Our office is equipped with the highest standard in state of the art technology that is designed for improving patient experience. We place a high commitment on making sure that patients are comfortable and that they feel safe and well cared for. We are also pleased to offer nitrous oxide sedation for patients who feel that they simply cannot muster up enough courage or energy to make them relax at the dentist’s office. Nitrous oxide sedation allows patients to feel completely comfortable, relaxed, and even unaware that any work or treatment is being administered. This sedation has been a huge advancement in dentistry because it has made more people willing to visit the dentist. Before you laugh at the though of relaxing at the dentist’s office, please come to Gold Hill Dentistry. Not everyone requires sedation to find that they are comfortable in our office because of the great lengths we go to in order to make our patients feel at ease. 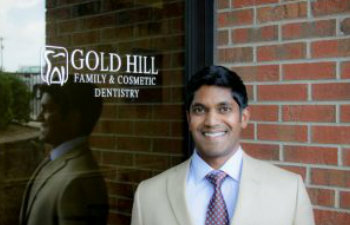 If you are looking for a dentist that you can trust to meet your oral health care needs as well as relieve your anxieties, call Gold Hill Dentistry today.